I confess I haven't finished ONE BOOK this week (started two but didn't finish either). Why? Gilmore Girls, Season 1. I've never seen it and checked it out from the library on recommendation of friends. I've laughed hard this week though which has to count for something, right? It's addictive!! I've seen the whole series. . .
Oh, no! 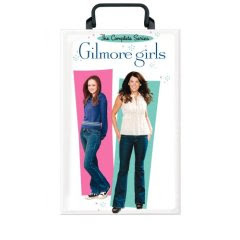 Does this mean that I'm going to have to get into Gilmore Girls now? I'm pretty confident about brushing off the recommendations of this show from some friends, but coming from you? Now, I have to rethink it. Gilmore Girls just might be my Bleak House. The witty banter! Tears! Tears! I loved it! I actually enjoy that show too! The dialog and personalities are just too great!